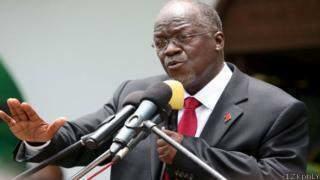 Tanzanian President John Magufuli has sacked two public officials after scolding one of them on live TV. He had asked the two municipal directors what their budget was for road construction in their districts. Neither could recall on the spot, and a few hours later both officials were sacked. No reason was given. President Magufuli's critics say he is becoming increasingly authoritarian. But many have praised the president for his no-nonsense style. His nickname is "the Bulldozer". The president was attending a ceremony in the northern town of Bukoba when the incident happened on Monday. A 30-second clip of the exchange - all in Swahili - shows him asking Mwantum Kitwana Dau to state how much money had been set aside for a road fund. When she couldn't remember, the president scolded her. According to one account, Ms Dau said that she oversees many departments and could not immediately recall the exact budget allocated for road projects. Mr Magufuli replied: "You can't talk to me like that."